A big part of fall sporting events is the atmosphere. Something that is part of this atmosphere that affects both the team performing and the crowd is spirit. “I think that school spirit has increased for the most part recently,” senior cheerleader Taylor DeWeese said. At the recent Otis Bison football game, junior football player Blake Lee said that he could tell the crowd was noticeably louder and more into the game. “When the crowd shows a lot of spirit and is really loud, it shows us that we’re not just playing for ourselves, but for our school, and that we have some school spirit to defend,” Lee said. 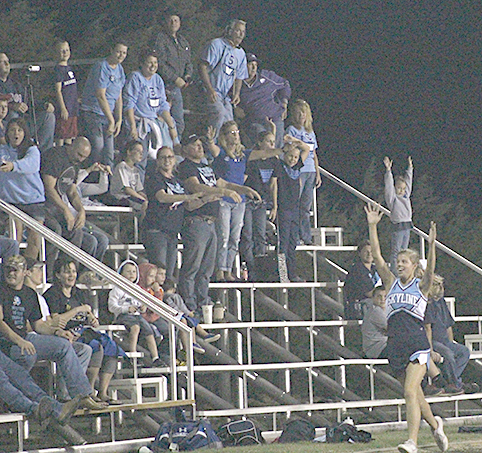 Some think that the spirited crowd helped push the football players into an overtime win at Otis Bison. DeWeese said that she felt like the football players could tell when the crowd was enthusiastic in cheering them on. She also thinks that it helps the team when the crowd is excited. “I think that when the crowd is louder, it helps us play better because we feed off of their energy,” junior football player Tristen Hogan said. Although there weren’t a lot of students at the game because it was so far away, the parents stepped up. It helped because there was strong spirit, no matter who was cheering. Football isn’t the only sport where spirit can help push the players to be better. This can happen in almost any sport. One of the biggest jobs that fall upon cheerleaders is the duty of trying to boost school spirit. “When there is more crowd participation, it is easier to cheer, and overall more fun and rewarding,” DeWeese said. There are many different ways that school spirit can be shown. One of the most obvious ways is cheering loud at school sporting events. Skyline sports teams have been showing support for each other by attending the other teams’ events. Sophomore cross country runner Miranda Ghumm said that it shows unity in the school when the volleyball team supports the cross country runners at meets. However, you don’t have to be an athlete to show school spirit. Another way to have school spirit is by participating in school events and activities. This could be as simple as dressing up for a spirit day or being in a school club. Being involved also gives you the chance to show off your school spirit and pride at different events. Showing school spirit is a vital part of the high school experience. It is something easy that you can do every day that will make your school better.